Told from Dunlin in all plumages by white rump, longer, more decurved bill and longer legs, giving it a more elegant appearance. Easily told in breeding plumage by chestnut-red face and underparts (often with white feather-fringes). 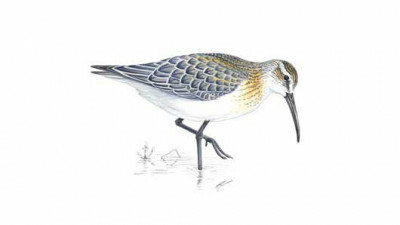 In winter, plain grey above, white below with a light suffusion to breast sides and noticeable white supercilium; then also told from Dunlin by cleaner appearance, whiter underparts and white supercilium. Usually in small flocks.